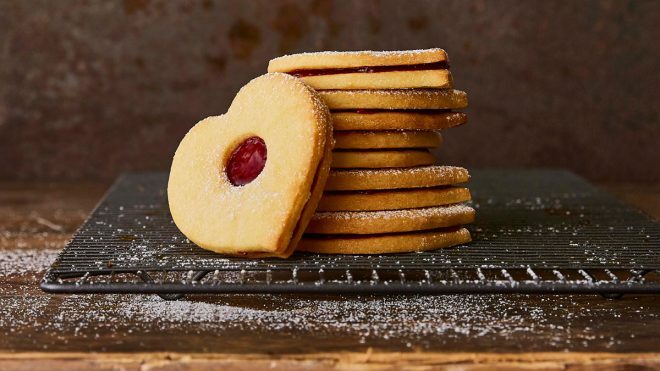 Simple to make love heart butter biscuits that would make a great gift for someone special. Preheat the oven to 170°C. Place the flour, butter, icing sugar and salt into a bowl. Using your fingertips, rub the ingredients together until the mixture looks like breadcrumbs. Add the egg yolks and mix until a dough forms. Turn out onto a lightly floured work surface and roll out to a thickness of about 0.5cm. Cut out equal love heart shapes using a cutter. Divide the biscuits in half. Using a 2cm cutter, make a hole in the middle of half of the biscuits and discard the dough. Place all of the biscuits onto a baking tray. Bake for 10-12 minutes, or until light golden-brown and crisp. Remove and transfer to a wire rack to cool. Place a small dollop of raspberry jam on the whole biscuit and then place the other half with the hole on top.